Justice Brett Kavanugh took the Judicial Oath as an associate justice of the Supreme Court Monday at the White House, administered by the man whose seat he now fills and for whom he once clerked, retired Justice Anthony Kennedy. 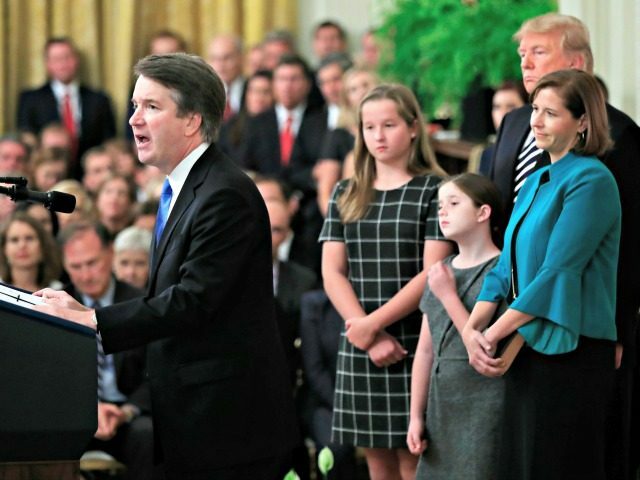 Kavanaugh became a justice formally on Saturday in a small private ceremony, but Monday’s oath-taking allowed him to address the country for the first time since being confirmed 50-48 in Saturday’s final Senate floor vote. Speaking after President Donald Trump, Kavanaugh sought to move past the historically unprecedented tactics that Democrats unleashed on him during the confirmation process and put to rest notions of his being controversial, biased, or partisan. “I was not appointed to serve one party or one interest, but to serve one nation. America’s constitution and laws protect every person of every belief and every background. Every litigant at the Supreme Court can be assured that I will listen to their argument with respect and an open mind,” the new Justice went on, repeatedly stressing a judge’s role as an independent “umpire” and not a policy maker. I am honored to serve alongside all of my new colleagues, each of whom I know, and each of whom I greatly admire and deeply respect. All nine of us revere the constitution. … The Supreme Court is an institution of law. It is not a partisan or political institution. The Justices do not sit on opposite sides of an aisle. They do not caucus in separate rooms. The Supreme Court is a team of nine and I will always be a team player on the team of nine.